Korn – Follow the Leader (1998) Review – Stuff and That. Album Review 5 Comments albumbbkcddead bodies everywherefieldyfollow the leaderfreak on a leashgot the lifeheadheavy metalit's onJonathan Daviskornmetalmunkymusicnu metalReubenreviewskaStuff and that. Sturdily Built With An Adidas Kilt. Yo, this be Reuben. Milo might get angry that I’m reviewing a Korn album, and giving it a high score, but I don’t care, because I like them. In fact, I really like ’em now. Take that, you twonk. However, if there is anything I can relate to Milo with on this subject, it is that Jonathan Davis isn’t the most endearing person on Earth. Even so, he’s far from a poor vocalist or a massive idiot (as Milo often says — he’s just jealous, let’s face it). 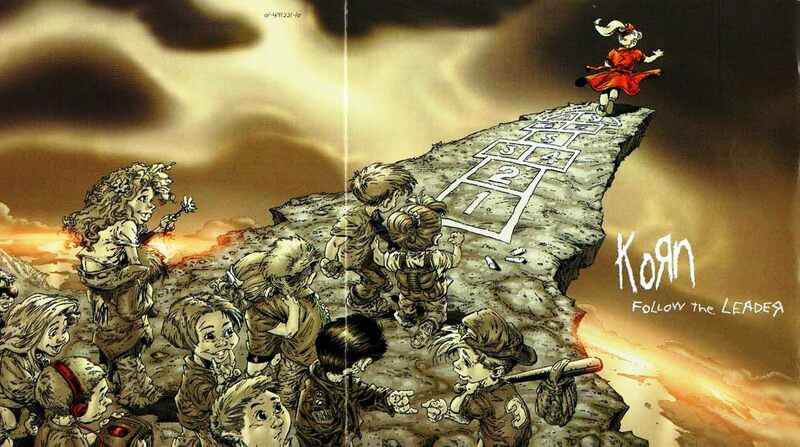 Follow the Leader is arguably the pinnacle album in Korn’s discography, and represents what the band does best (and worst) in one full package. What Korn does best is blast that aforementioned horrible, sinister, but deliriously entertaining form of nu metal through your cheap speakers and JVC earphones (that’s what everyone has, right?). This instantly recognisable sound is brought about by the powerful sound of the two power-chord heavy guitars of Head and Munky, the fantastically skilled drop-tuned five-stringed bass from Fieldy, the high-pitched harmonics, pounding drums and J.D’s vocals which range from slightly crappy clean singing, brutal growling, ska and just plain shouting. His vocal range may not be quite Chris Cornell’s, but it mixes with the music so well that it doesn’t matter. In fact, most every sound in Korn clashes with the other, which would at most points be a bad thing, but in this case – much like Primus – the sheer skill on display means it’s a sound to behold, or alternatively, the sound is so unique that it drags you in with sheer intrigue. Whichever one it is, I’ve grown to love the crazy sound of Korn. Follow the Leader is my guess for the perfect example of Korn’s musicianship and style. In It’s On, Freak On a Leash, Dead Bodies Everywhere and Reclaim My Place, especially, their iconic noise is represented in the best and most confusing way possible. Each song, including these four, holds interesting and winding song structures, throwing you around the creepy and wonderful land of the band like it’s forcing you to enjoy it. The mesh of noise practically vomits on you, and for some strange reason, you want to lick it. Follow the Leader encompasses some of the heaviest tunes I’ve heard in metal, as its core power is almost unfathomable in its ridiculous noisiness. It’s not tuneless, either. Follow the Leader offers up a selection of melodic power houses, with surprisingly catchy hooks and memorable vocal passages from ol’ J.D streaming through the record, accompanied with rolling riffs from Fieldy and the crew with their genius crack-pot tunes. If there is one thing true about Follow the Leader, it’s that it is memorable. You don’t quickly forget anything on this album, and you certainly don’t forget Freak On a Leash. Whether you love or hate it, it will stick with you. I swear Milo (your average Korn hater) knows Freak On a Leash to a tee. Look, I appreciate Korn definitely isn’t for everyone. Let’s put this into perspective, it’s weird, and it’s far from accessible. Some people might just cringe with utter confusion to the ska sections, and cringe for other reasons when J.D repeatedly shouts “WHAT THE F*CK” through their speakers in Reclaim My Place. Follow the Leader isn’t something I would have liked three years ago. Its structures are too all over the place, there’s too much swearing and it’s just damn strange. But man do I like it now. And, this album saw Korn become just about the biggest band in the world for a year or two — which is huge for a band in this alternative medium. I guess it isn’t too hard to see how they did it, either. The world had barely known music like this before, and were brought in to this album with its party vibes, which were much appreciated at the time – and not just any party, some kind of crazy drug-rave party — Korn and this album was the perfect way to unleash their inner desire to just go a bit mental with its no-hinges approach. But however much I love it, I must admit it’s not quite perfect. There are two songs on the album that I just skip. All in the Family and Cameltosis shouldn’t be on the record, they just take up needless space. Funnily enough, they both feature guest stars. The problem is, they take the great music of Korn, and top it with some boring rap, and in turn bring in some of their crappy samples. All in the Family is just an incredibly obscene argument between Fred Durst and J.D. But other than those two tracks there isn’t much wrong with this album at all – just delete them and you’ve got yourself one of the best metal albums you’ll ever hear. A couple of dud tracks don’t hold Follow the Leader back nearly enough to say it isn’t Korn’s definitive album, because, well, it is. It houses its iconic sound in its greatest form as we are graced with a selection of the band’s best songs. It’s On, Freak on a Leash, Got the Life, etc. are some of my favourite metal songs. Unique, thrilling and morally questionable, Follow the Leader is one of my favourite metal albums of all time, let alone of its decade. You can just feel the party atmosphere in the record, with the energetic instrumentals, crazy vocals and unmatched bouncy groove exploding out of the speakers at every listen. Tell your friends, family and creepy family friends! Good album! Funnily enough I’m in the British equivalent to high school at the moment and I’m loving ’em. Nostalgia!!! I remember when this came out when I was in middle school. You feel nostalgia for it for a reason, it’s darn good! Pingback: RANKED: Rage Against the Machine Albums – Reuben – Stuff And That.